Is an Employer’s Use of Background Credit Checks Appropriate? Under fire from consumers, state legislators, and the EEOC, the background check utilized by employers to judge individuals’ suitability for certain jobs is being challenged. The use of background checks and specifically the background credit check has been under intensifying debate among national and state officials causing some to believe the use of credit checks should be more severely restricted or banned altogether. Why? The rationale is that the recession, high unemployment, and recent “predatory lending practices” have impacted the credit histories of many people, creating a situation where a blemished credit report will impact a person’s ability to land a job. On the other side of the debate, employers argue that credit checks are considered a valid indicator of a person’s judgment and potential risk to the company and provide useful information that could not otherwise be confirmed by an employer. Credit checks on all job candidates are the exception — not the rule. Many organizations do not conduct credit checks at all. The use of credit background checks has not increased in the last six years. Employers generally conduct credit checks only for positions for which they are relevant, such as positions with financial responsibility or those with access to confidential information. Employers overwhelmingly use credit checks at the end of the hiring process, not to screen out applicants up front. Employers regularly go beyond current law requirements and allow candidates to explain their credit history. View more presentations from shrm. As an employment screening company we are clearly invested in the outcome of the debates around employment-related credit checks. That said, we do feel there are compelling reasons and supporting data to indicate that background credit checks are appropriate and useful in many situations. First, let’s recognize that employers have a variety of methods to use in the process of screening potential employees. Employment background checks are important and are something employers have a right and an obligation to do in establishing their duty of reasonable care in the hiring process. Credit checks are just one of the methods employers can use and they should be treated as “just one.” In other words, it rarely makes sense for employers to base their entire hiring decision on the results of a credit check (and data shows employers are NOT using credit checks as the sole determinant). An employment credit check provides a summary of balances, payment history, liens, judgments, bankruptcies, and official inquiries. Imagine the liability an organization could face not knowing that the CFO they’re about to hire has sizable judgments against him or her? Or imagine hiring a stock broker with significant personal financial issues? Even the government will not hire for positions involving national security or FDIC clearances without a background credit check. The liability for these and other positions in accounting departments, high level executives or positions dealing with sensitive personal data of customers or employees, among others, is simply too great for an employer to overlook individual credit history. What will happen to the crime and fidelity insurance premiums of organizations if credit checks are no longer allowed? Employers have an obligation under EEOC guidelines to ensure the type of background check they use matches the risk and responsibilities of the position and that the factors used to judge the results of a background check (i.e. what shows up on the credit check) take into account the likelihood that what’s found will impact the applicant’s performance on the job. In doing so, credit checks can provide valuable insight which, when used along with other methods (such as reference checks, criminal background checks, education verifications, etc. ), can help the employer better understand the totality of an individual. When used in the appropriate situation and interpreted according to already existing laws, including the Fair Credit Reporting Act of 1970 and the Civil Rights Act of 1964, employment-related credit checks offer valuable information about an individual’s level of responsibility. What do you think? Drop a comment here or contact us to discuss. 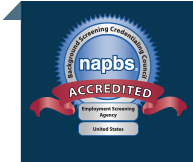 Is your organization in need of employment screening services? Call us today for a free consultation (866) 276-6161 or Request a Meeting.